Rated PG for thematic material including reckless behavior, brief suggestive content and some language. "Jem and the Holograms" is one of the weirdest big screen adaptations of a cheap TV cartoon that I've seen. That's praise. I don't know what I expected going into the movie, but it wasn't a coming-of-age drama that compensates for its near plotlessness with charming and sometimes touching performances, astute observations about how today's youth use technology to deepen their sense of community and self, and some lush handheld camerawork (in CinemaScope ratio!) that occasionally evokes, for real, "The Tree of Life" and "To the Wonder." If Terrence Malick had directed "Josie and the Pussycats," this is what it might have looked like. As written by Ryan Landels and directed by Jon M. Chu (director of two "Step Up" films and "G.I. Joe: Retaliation") the film boasts lots of tight shots of people's faces lost in thought, and several self-contained, intimate musical numbers, including an a capella performance in a nightclub that has just suffered a power outage, and an impromptu song on the sand beneath a pier. In a lot of these scenes, a small robot hangs out and makes adorable noises. More about the robot shortly. The source material is a Hasbro cartoon that aired on Saturday mornings in the 1980s, about a teenage singer-songwriter named Jerrica Benton who ends up fronting a band that includes her biological sister and two foster sisters. She wows the record-buying public with the help of her late father's projection system, Synergy, which creates a three-dimensional (and seemingly tactile) alternate identity for her. There are rival bands trying to ruin Jerrica's success and get their hands on Synergy, battles over control of the band and its music (mostly involving their malevolent manager, Eric) and other intrigue. If you're thinking about seeing the film you probably already know all this; I include the summary to point up the contrast between what you might reasonably expect the film to deliver—jangly tween pop, contrived "humor," and an overall air of disposability—and what it actually gives you: a movie which, while never caring too much about entertainment basics, has personality, even a vision. 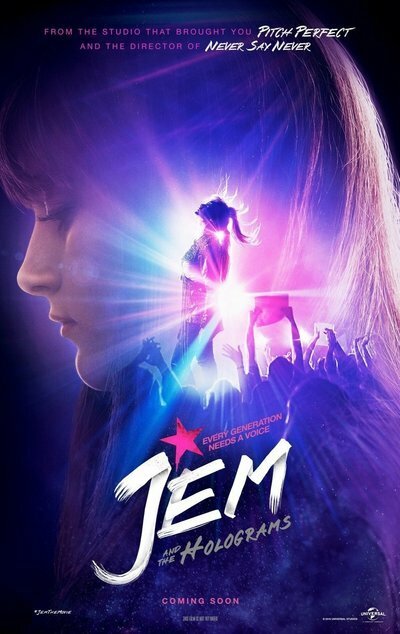 Aubrey Peeples plays Jem, who narrates the movie as an extended flashback. She tells us how she became a near-instantaneous pop sensation after years of grieving her father's death and living with her blood sister Kimber (Stefanie Scott), foster sisters Shana (Aurora Perrineau) and Aja (Hayley Kiyoko), and everybody's aunt/matriarchial figure, Bailey (Molly Ringwald, who projects such strength and warmth here that you will wish she'd been given more to do). Kimber uploads Jem's solo acoustic number without her consent to get her to stop hiding her talent and reconnect with the world; the video instantly gets zillions of views and earns them an audition with the rapacious producer Erica Raymond (gender-shifted so that Juliette Lewis can play the role). Erica is a vivid caricature of a hard-driving, insincerely "sincere" record industry manipulator, always lip-smackingly corny (the film is a showbiz melodrama, so that's fine). Her dialogue is better than everyone else's, probably because she was the most fun to write. When Jem says she knows all about her because she read her New York Times profile, Erica replies, "The writer I wasn't sure about, but thank you." She gets one of the year's better screen entrances: a closeup of her spike-heeled shoes disembarking a chauffeured car and click-clacking up the family's front walk, kicking a skateboard aside as she goes. Jem doesn't want to dive into the shark pool that is the entertainment industry, but her family's home is under threat of foreclosure. Erica promises her that she and her sisters will be paid in full once their first tour has concluded. Who wouldn't trust a record executive? There's a "love interest" in the form of Erica's road manager and band-minder Rio (Ryan Guzman), who is tasked with making sure they don't drink or smoke or break curfew, but ends up taking a more personal interest in Jem. "Love interest" is in quotes because this film's target audience is mainly preteen girls, and it's very chaste; I don't remember more than one kiss in the movie. That said, "Jem and the Holograms" is quite good about giving the film a female gaze rather than the customary male one: there's a knowingly gratuitous shot of shirtless Rio, paired with furtive glances by Jem, and several makeover montages, always done from the vantage point of girlfriends bonding through grooming and shopping rather than that of, say, a leering older male studio executive, which might have been the point-of-view if this film had been made in the '80s. "Jem and the Holograms" is sweet and relaxed, bereft of meanness, and completely invested in Jem's grief management and her love of her sisters and aunt. There are several moments when it seems to remember that it can't just be pleasant without giving us some kind of story, and suddenly tosses three of four twists at us, all at once. It feels cobbled together, but not in a cynical way. It could have just as easily been a period piece set in the late 1940s, starring a Shirley Temple-type who really wants to get a studio contract so that she can bail out the orphanage where she grew up, or pay for grandma's heart operation, or prevent a wagon load of kittens from being turned into pelts. In other ways, though, it feels entirely modern, plugged into online life in ways that most recent films that are explicitly about technology somehow can't manage. Peeples is excellent, at times rather Kristen Stewart-like. Her mostly unsentimental performance sells the movie's unabashed sentiment, even when she and the girls are doting on the aforementioned robot, who carries several secrets within him and ultimately comes to seem like an E.T.-like figure. These girls live their lives on Instagram and Snapchat and take selfie pictures and videos of everything, but never for a moment are they presented as trivial people, nor is the authenticity of their emotion called into question because they lived their lives online. The movie takes their dreams and miseries seriously and gives even characters who have just one or two scenes (such as a parking lot attendant and a security guard) a personality. It's not a good film in terms of plot or tonal consistency, and it offers almost nothing in the way of true conflict, but it's always an observant and sincere movie, and occasionally a beautiful and deep one. The Magic Touch: Dave Franco on "Now You See Me 2"